I love community supported agriculture (CSA). For a couple of dollars each week, I get fresh, local produce that is in season, and I support my local economy. It also forces me to diversify my cooking and to be creative. For example, this past week we received savoy cabbage, kale, a fennel bulb, spinach, lettuce, carrots, and one lonely beet. The savoy cabbage and carrots were destined for Asian Rotisserie Chicken Salad (a recipe from http://www.CookSmarts.com). The spinach and lettuce are destined for green smoothies. There are numerous options for the kale. But what to do with fennel and a beet? 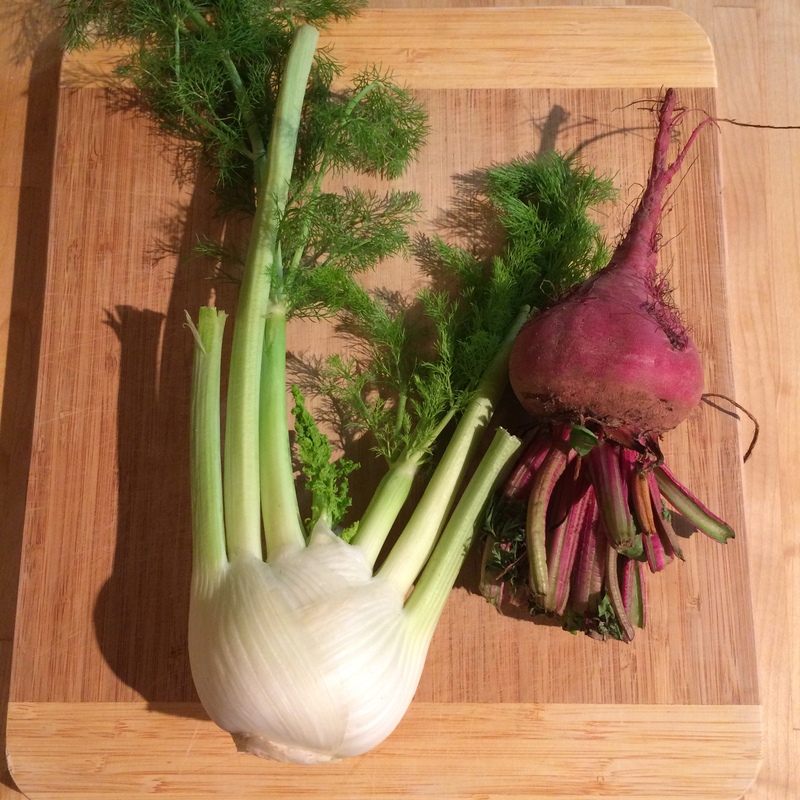 What do you do with a fennel bulb and one beet? I searched through my pantry for inspiration and came up with this idea for a soup made with the fennel, the beet, the kale, and a couple of pantry staples. Preheat an oven to 425 degrees. Trim any stalk from the beet. Coat the beet with olive oil and season with salt and pepper (about 1/8 teaspoon of each). Wrap the beet in aluminum foil and put it in the oven. The beet should roast for 45 minutes to an hour, which is plenty of time to make the rest of the soup. Toss the chopped fennel and the diced onion with two teaspoons of olive oil. Spread the fennel and onions evenly on a jellyroll pan or cookie sheet lined with parchment paper and roast for 12 minutes. Stir the fennel and onion mixture and roast for another 5 minutes. Stir the vegetable mixture again and add the chickpeas. Roast the fennel, onions, and chickpeas for 10 minutes.Roasting the fennel like this really helps mellow its flavor. Remove the pan with the fennel, onions, and chickpeas from the oven, but let the beet continue to roast. While the beet roasts, heat a tablespoon of butter and 1/2 teaspoon of olive oil together in a 6-quart dutch oven over medium heat. Once the butter melts, add in the garlic and cook for 3 minutes, stirring frequently. The garlic should be a golden brown, but not burnt. Add in the dried chili flakes (you can add more if you prefer a spicier soup). Cook for an additional minute, then stir in the crushed tomatoes. Add in the balsamic vinegar. Let the tomato mixture cook for 3 minutes, then gradually stir in the chicken stock. Add in the lime zest and lime juice, the dried oregano, and the dried basil. 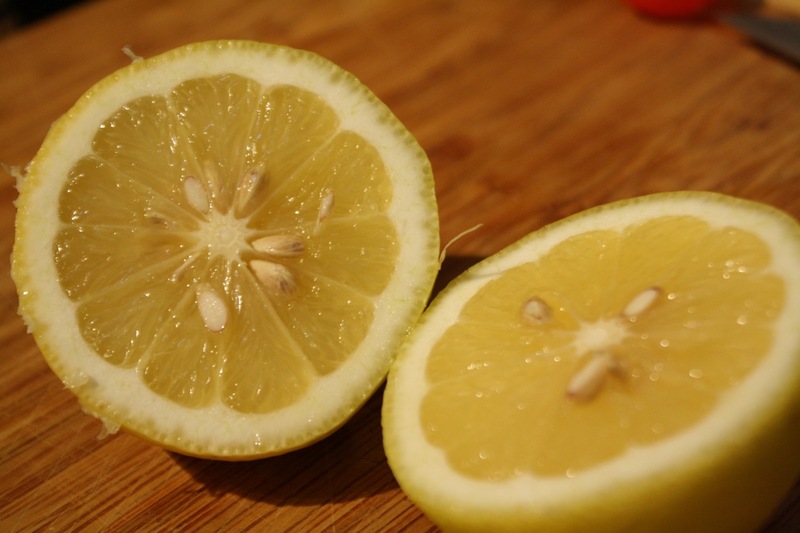 The lime zest and juice adds a brightness to the soup that enhances the flavors of the other ingredients. Add the roasted vegetables and chickpeas to the soup. Turn the soup down to low heat and let it simmer while the beet roasts. Once the beet has finished roasting, remove it from the oven and let it cool 10 minutes. Once cool, peel the outer skin from the beet, chop the beet, and add the chopped beet to the soup. 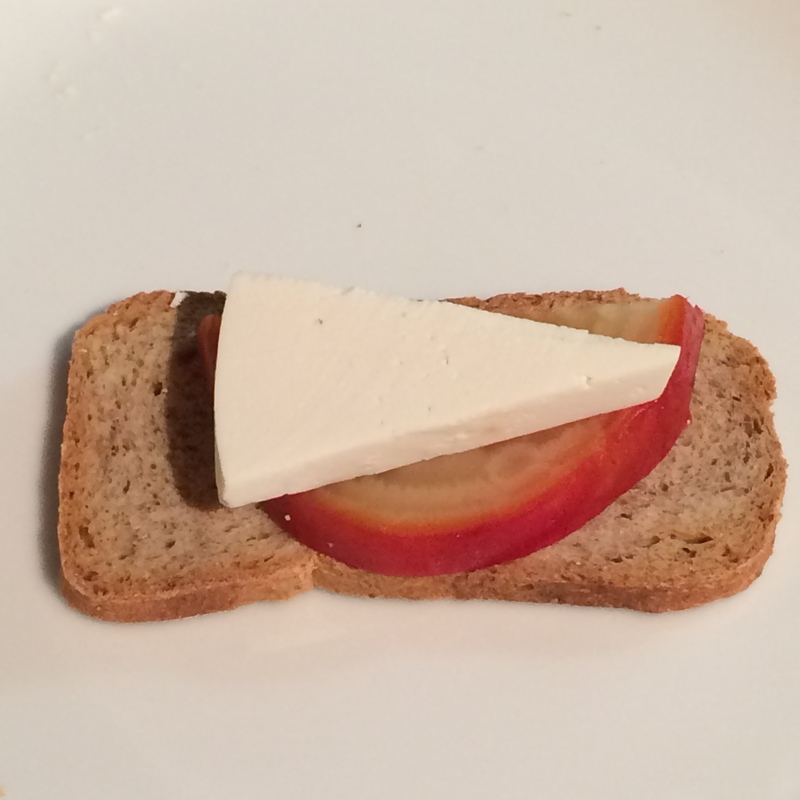 As a quick snack, I stole a slice of beet and put it on a Melba toast with a hunk of Mizithra cheese. Not a bad little snack to enjoy while the soup cooks. 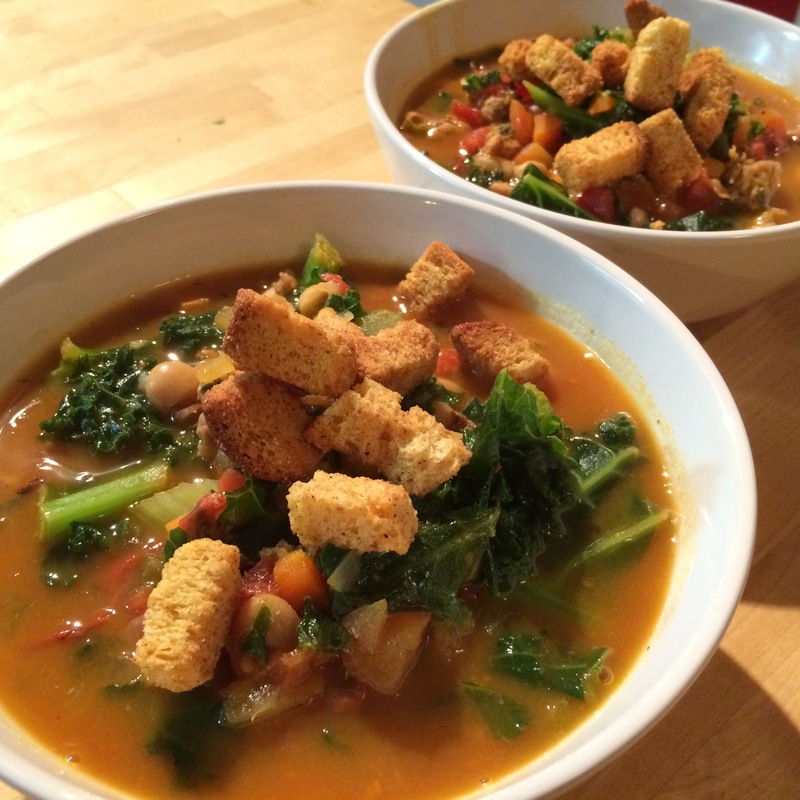 Return the soup to medium heat and add the chopped kale. Season with salt and pepper to taste (I added about 1/2 teaspoon of salt and 1/8 teaspoon of pepper). Once the kale has wilted into the soup, it is ready to serve. 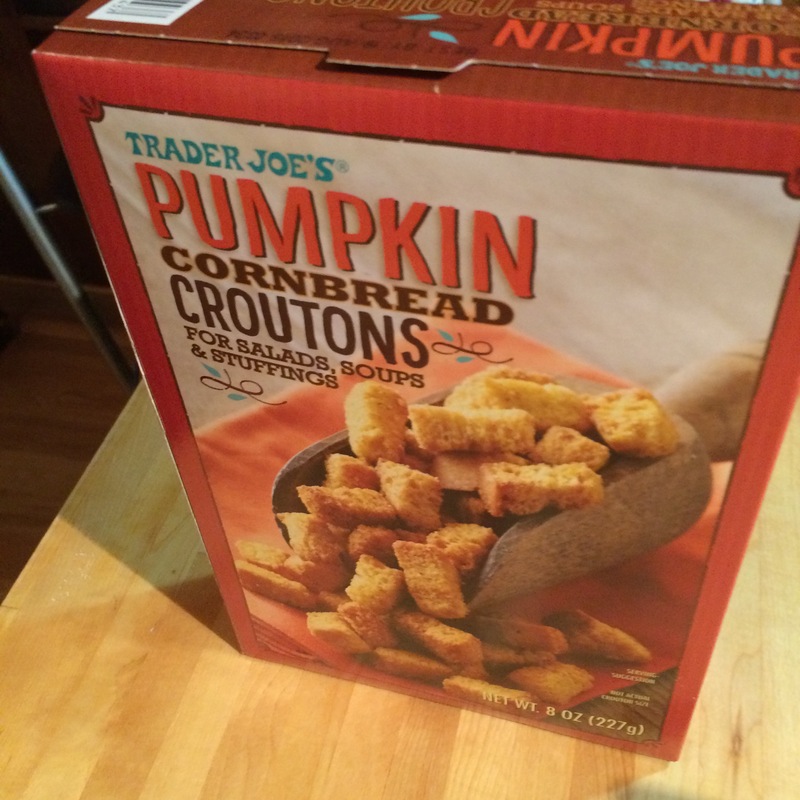 October is our annual “go buy all things pumpkin from Trader Joe’s” month. Each year we pick up a variety of pumpkin goods ranging from pumpkin bagels to canned pumpkin to pumpkin ice cream. Our new favorite are the Pumpkin Joe Joe’s, pumpkin sandwich cookies with a pumpkin cream filling. 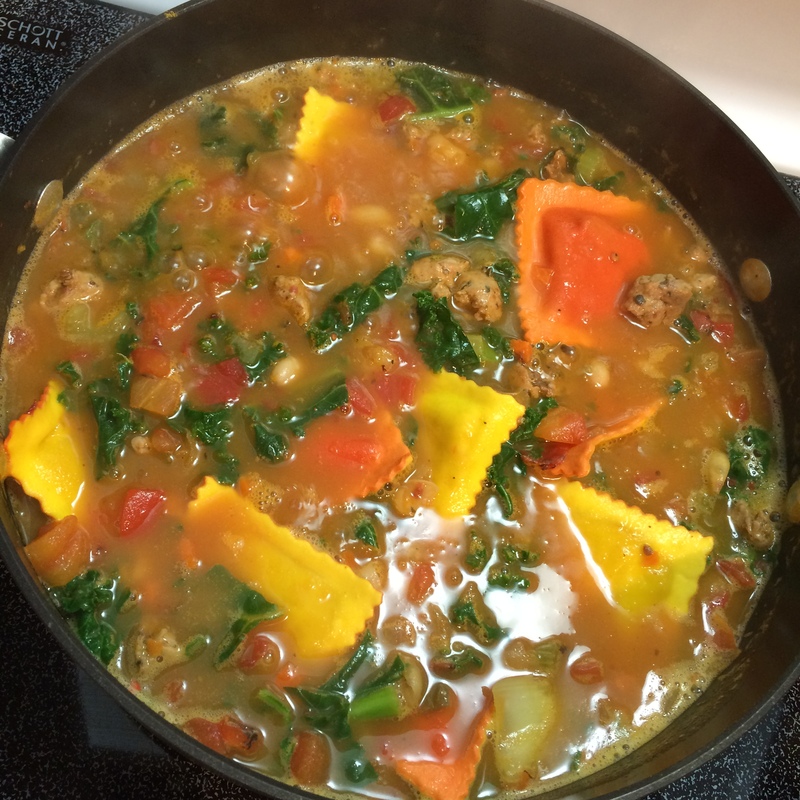 Inspired by the variety of pumpkin goods at Trader Joe’s, I came up with this recipe for Pumpkin Ravioli Soup. Made entirely of ingredients purchased from Trader Joe’s, the pumpkin gives the soup a creamy texture. Using the prepared ingredients also makes this a quick dinner to cook. In a 5 quart pot, heat the olive oil over medium heat. Once the oil is hot, but not smoking, add in the mirepoix and stir until the onions become translucent, about 3 minutes. Remove the sausages from their casing. Discard the casing and add the sausage to the mirepoix, breaking it up into small chunks as it cooks. Cook the mirepoix and sausage until the sausage is no longer pink, about 2 minutes. Add in the can of fire roasted tomatoes and the South African Smoke seasoning and cook for another 3 to 5 minutes. 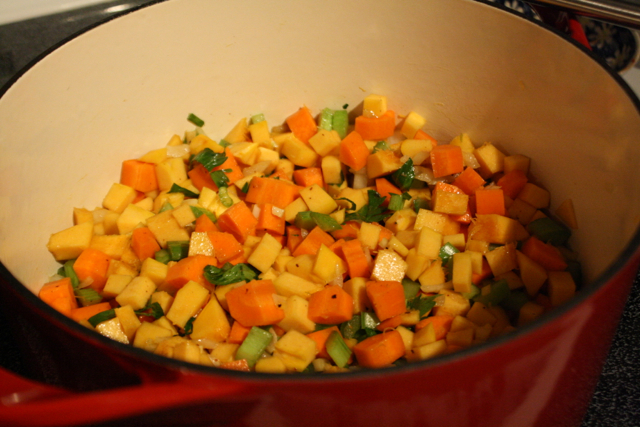 Add in the canned pumpkin and stir until the pumpkin dissolves into the mixture, then add in the beans. Carefully stir the mixture while pouring in the chicken stock. Bring the soup to a boil, then reduce the heat to low. Let the soup simmer for 15 minutes. Add the kale and stir until wilted. Add in the pumpkin ravioli and cook for 3 minutes. Salt to taste and serve the soup topped with a handful of pumpkin cornbread croutons. The soup has a slight kick to it from the fire roasted tomatoes and South African Smoke seasoning, so substitute regular diced tomatoes and curry power or paprika if you prefer a milder soup. Back in college, several years before we got married, there were a couple of brief periods where Jill and I stopped dating and took “breaks.” During one of these breaks, I started spending more time with one of Jill’s roommates, who swore to me that her mother made the best chicken tortilla soup in the world. Though I am not an overly competitive person, I do like a good culinary challenge here and there. 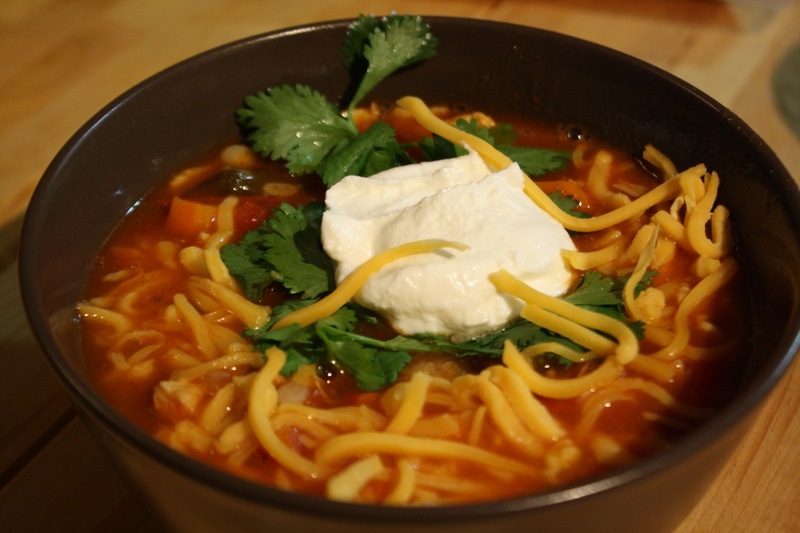 So, I decided to create the best chicken tortilla soup recipe. Ever. I researched recipes, experimented with flavor combinations, and tasted every bowl of chicken tortilla soup I could find. I ordered chicken tortilla soup from McAlister’s Deli, Panera, Atlanta Bread Company, and anywhere else I could find it. I bought every brand of canned chicken tortilla soup I could find. Ultimately, I came up with this recipe. 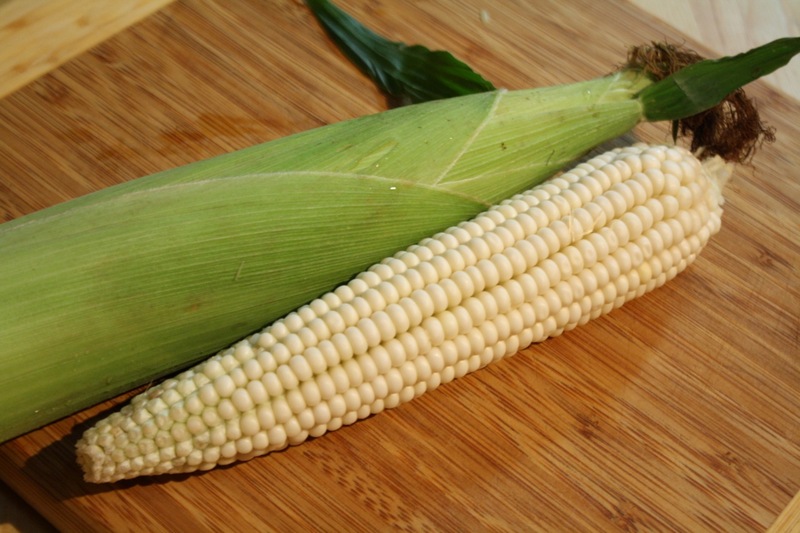 I will occasionally make slight variations, such as using fresh corn versus frozen corn or using lemon juice instead of lime juice, but I always follow this general recipe. In a large stock pot, bring salted water to a boil. Add chicken and cook until fork tender and fully cooked, about 15 minutes. Remove chicken and shred chicken using two forks. 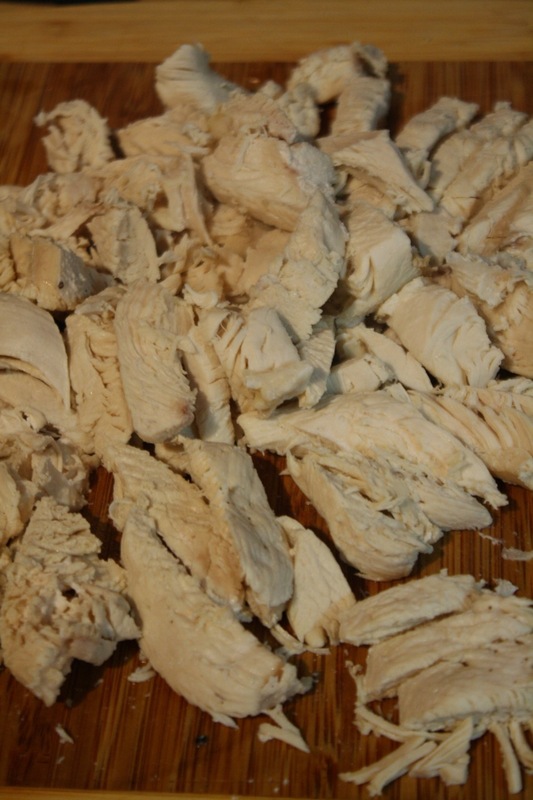 You could also roughly chop the chicken using a knife, if you preferred. While the chicken is cooking, in another large stock pot, heat olive oil over medium heat. 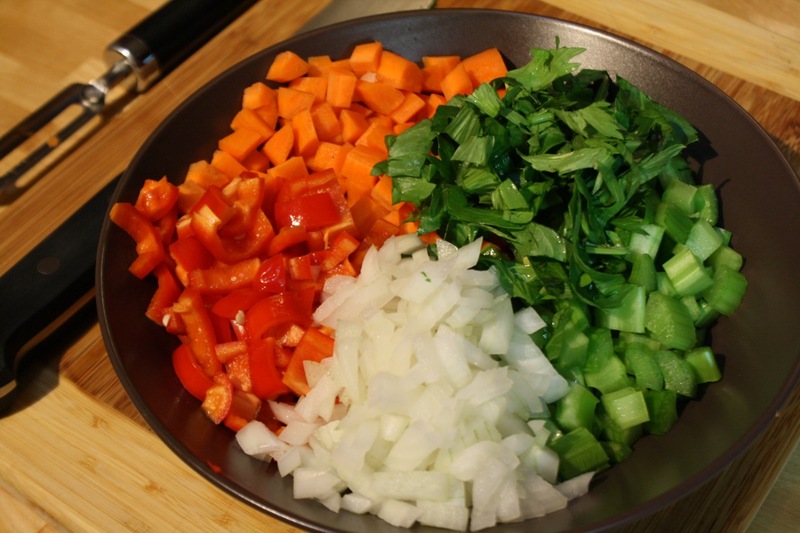 Add garlic, onion, celery, red bell pepper, and carrots and saute until tender. Add chili powder and cumin. Stir the spices and vegetables until fragrant. 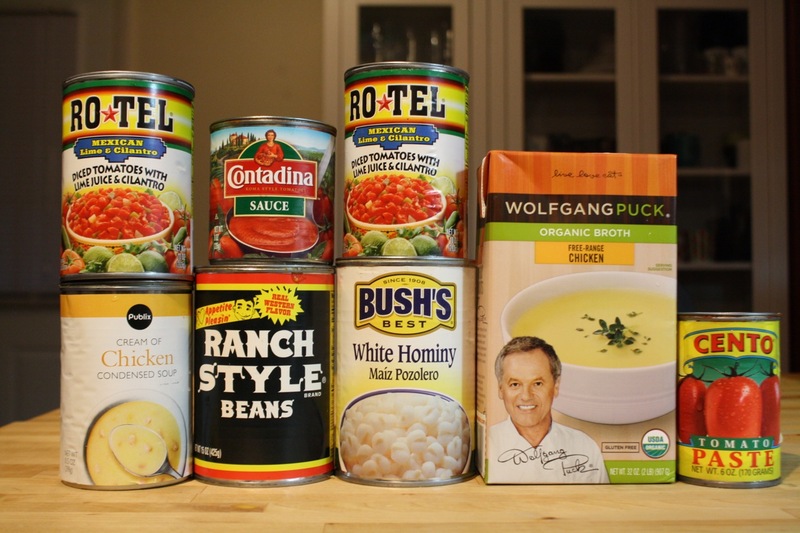 Add the Ro-tel tomatoes, cream of chicken soup, ranch style beans, tomato sauce, and tomato paste. Stir until all ingredients are thoroughly combined. Add the chicken stock, hominy, cooked chicken, and frozen corn. Add salt, pepper, and tabasco sauce, to taste. Stir in the lime juice and mix well. Bring to a boil over medium high heat. 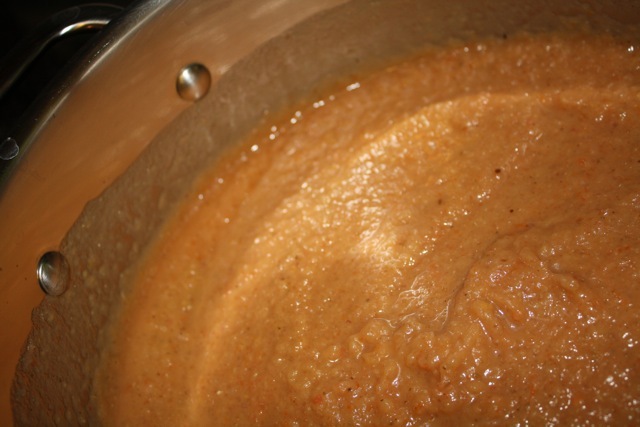 Once the soup reaches a boil, cover, reduce heat, and simmer at least one hour. To serve, crush tortilla chips in the bottom of a bowl, pour the soup over the chips, and serve topped with shredded cheese, sour cream, and cilantro. You could also top with avocado, if it is in season. The sour cream is very important. During our break, I made chicken tortilla soup with Jill’s roommate and sent some back for Jill too (I must have known we would get back together). Jill’s roommate gave the soup to her, but didn’t tell her to add the sour cream. Maybe it was an accident or maybe it was intentional (we’ll never know), but the spiciness was definitely overwhelming. Jill’s roommate would never admit that my soup was better, but I could tell she thought so. 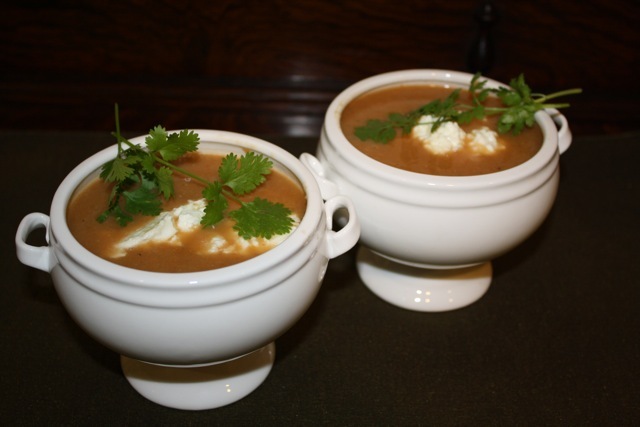 After she learned to add sour cream and cheese to the soup, this recipe quickly became one of Jill’s favorites also. The hominy is actually our favorite part of the soup. Over time this has become my signature dish, requested often by friends and family. Fall is my favorite food season. I enjoy the hearty, earthy flavors of fall vegetables and wait patiently through the year for the weather to cool down just enough to spur me to make big satisfying pots of chili or stew. Inspired by the produce that has begun to show up in the grocery stores recently, I decided to make a pot of vegetable soup. For the soup, start with the traditional carrots, celery, and onion. Peel and dice the carrots, cut the celery stalks in half lengthwise and dice the halves, mince the garlic, and finely chop the onion. To this traditional mix, also chop about four ounces of baby portobello mushrooms and prepare a Sweet Dumpling squash. To prepare the Sweet Dumpling squash, cut the squash in half, scoop out the seeds with a spoon, and carefully peel the the skin of the squash off with a sharp knife. 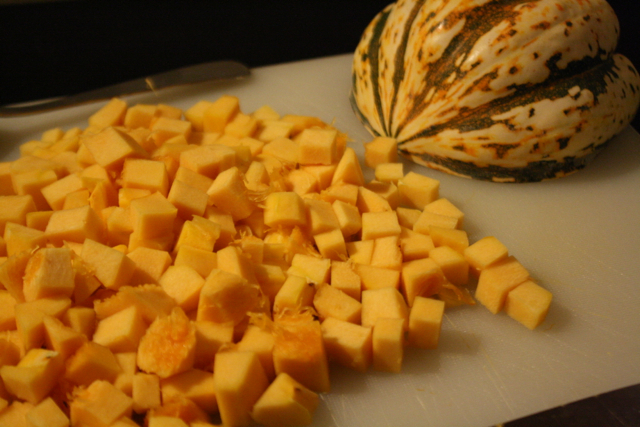 Dice the squash flesh into pieces about the same size as the pieces of diced carrots. 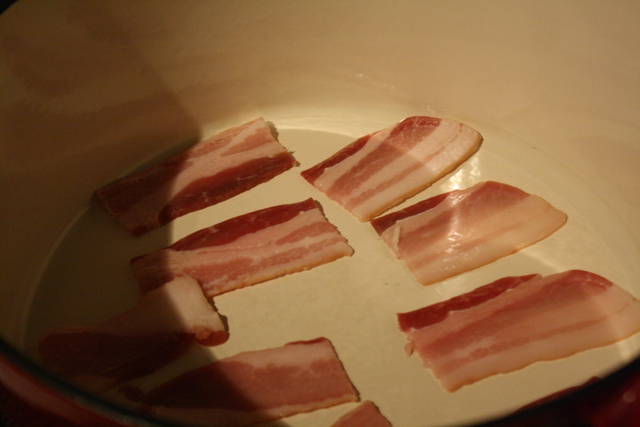 In a 6-quart cast-iron dutch oven, cook four slices of bacon (halved) on medium heat until crispy. Remove the bacon and set aside for later. For a healthier option, leave out the bacon and add olive oil to the pot instead. After removing the cooked bacon, add the carrots, celery, onion, garlic, and squash to the pot with the bacon grease, cooking about 15 minutes until the vegetables soften. Once the vegetables soften, add dried sage and thyme (about a half teaspoon each) and the can of diced tomatoes with their juices. 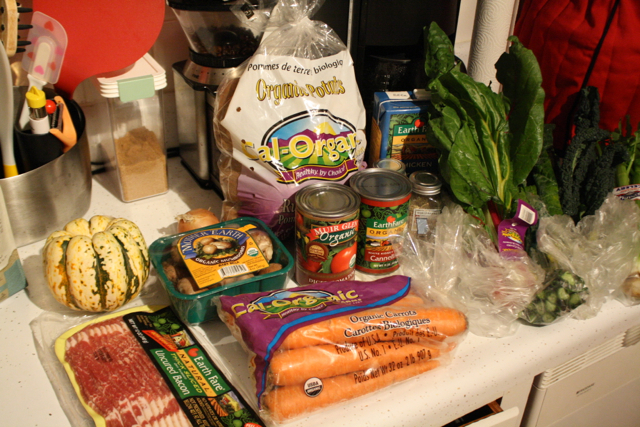 Add in the chopped mushroom and the can of cannellini beans. Mix well and pour in the chicken broth. Bring the soup to boil and reduce the heat to medium low. 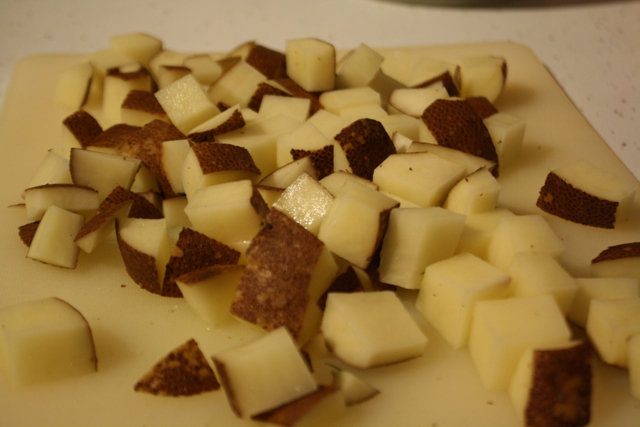 Dice the Russet potatoes and add them to the simmering soup. After about 10 minutes, check to see if the potatoes are soft. 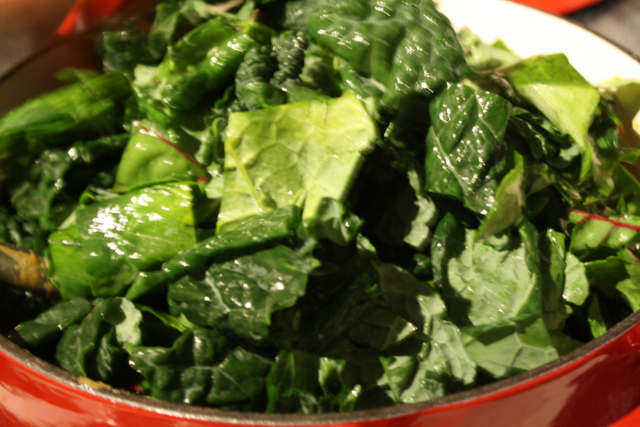 While the soup simmers, wash and cut the kale and Swiss chard into 1 inch squares., removing the stem. 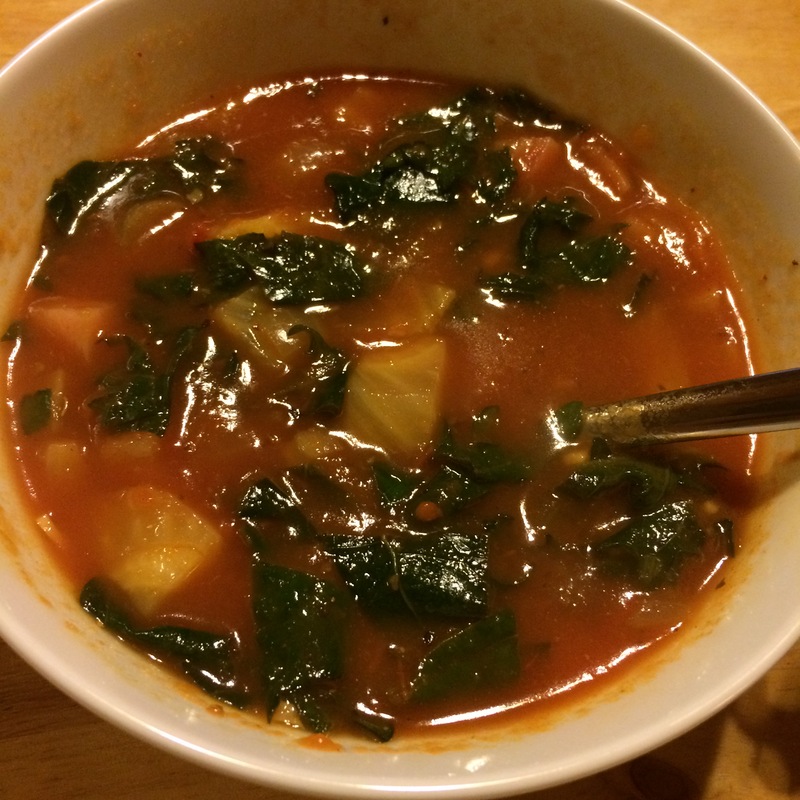 When the potatoes are soft, add kale and chard to the soup. 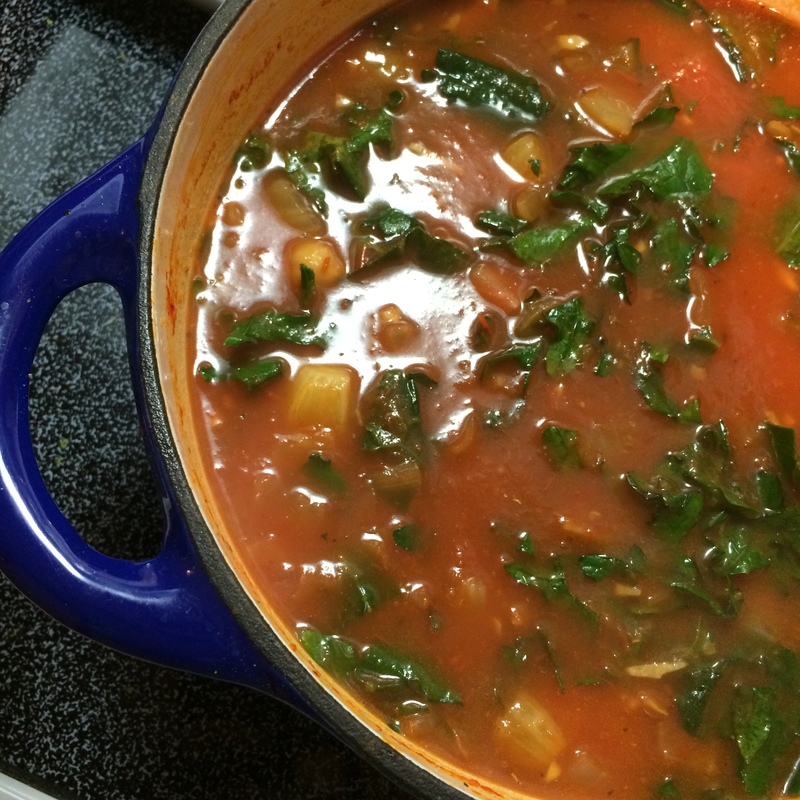 As the kale and chard begins to wilt, stir the soup well. Add salt and pepper to taste. 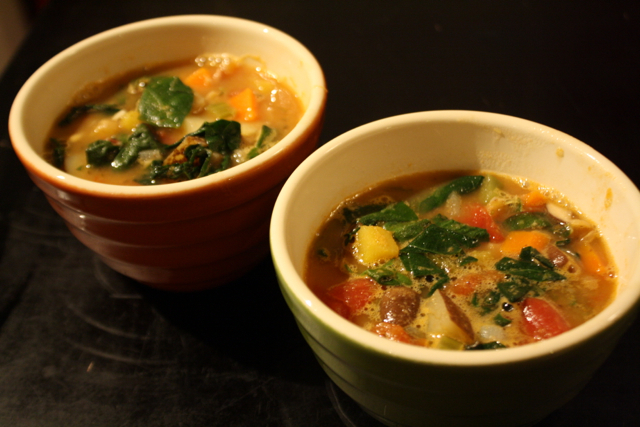 This hearty, fall inspired soup is full of vegetables and flavor. 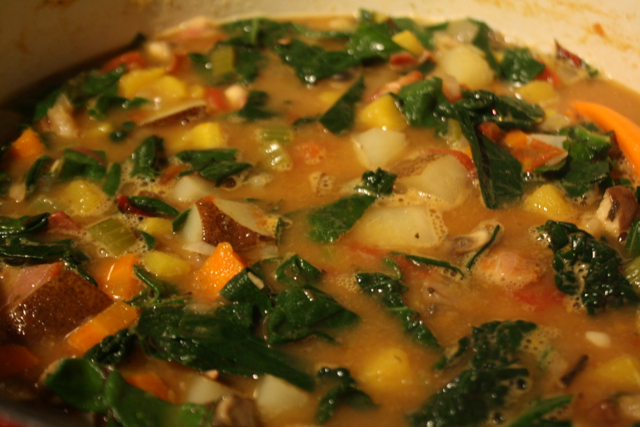 The Sweet Dumpling squash, mushrooms, kale, and chard provide a tasty twist on more traditional vegetable soups. Bowls of this warm soup offer earthy, satisfying flavors of the season, perfect for the Fall’s cooler weather. Jill’s favorite food is eggplant. At least it was last time I checked. Combining her love for eggplant with her childhood stories of watching David the Gnome while eating tomato soup, I ventured to make this recipe. I also had the good fortune of being given some fresh eggplant my parents grew. 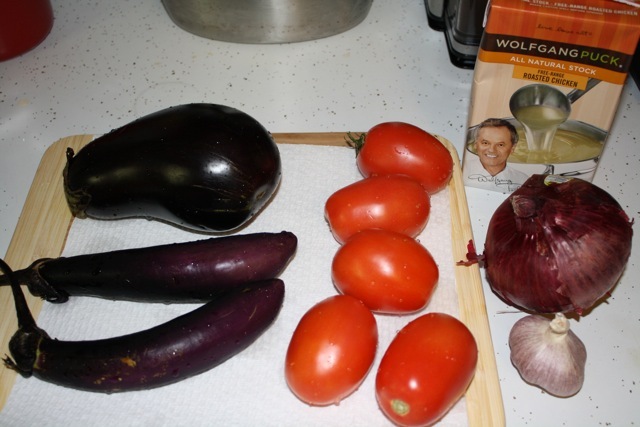 The two japanese style eggplants from my parents garden were supplemented with an Italian style eggplant from Publix. Olive oil, salt, pepper, cilantro (from my garden) and goat cheese are not shown in the photo. After slicing the veggies in half, they were all seared in a little olive oil before going into the oven to roast. 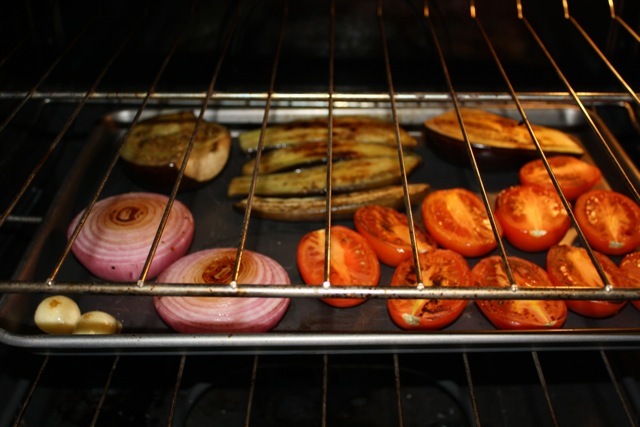 After about 25 minutes in a 350 degree (F) oven, the roasted veggies should be caramelized nicely. After making this recipe the first time, I could definitely roast more garlic. Much more garlic. 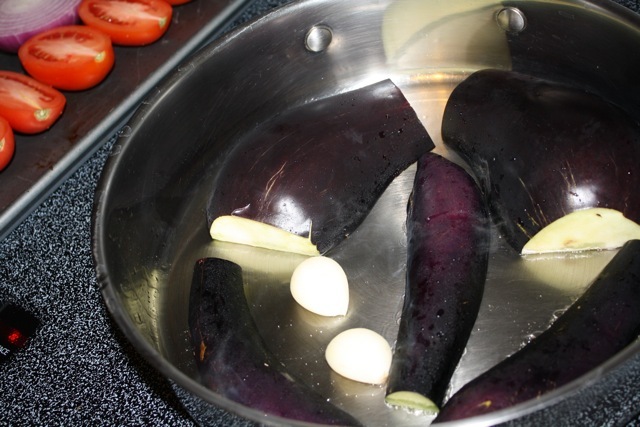 Before pureeing the vegetables in a food processor, the eggplant pulp should be pulled away from the skin. If your vegetables have roasted enough, this should be easy to do. 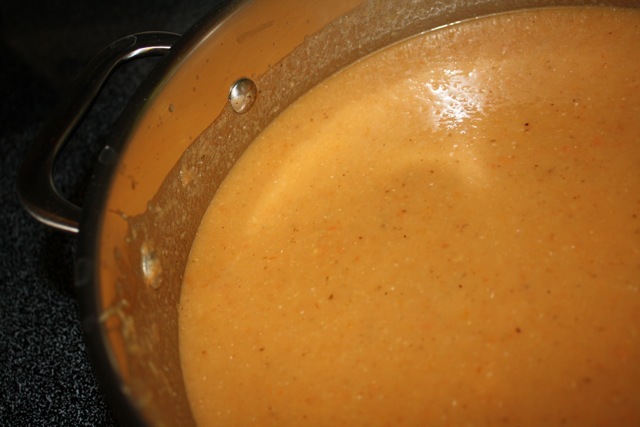 Blend the roasted vegetables in a food processor with some of the chicken broth until smooth. Pour the puree into a pot over medium heat. At this point, it probably will not look overly appetizing and will resemble baby food like the photo below. While the soup simmered, I decided to add goat cheese. 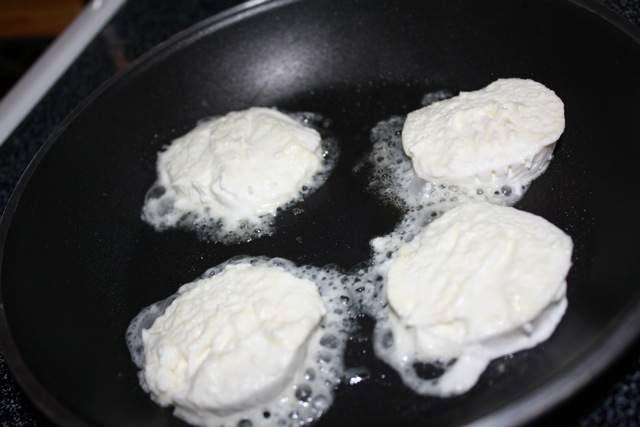 I lightly browned the goat cheese in a small amount of olive oil, but would probably add unheated goat cheese next time. 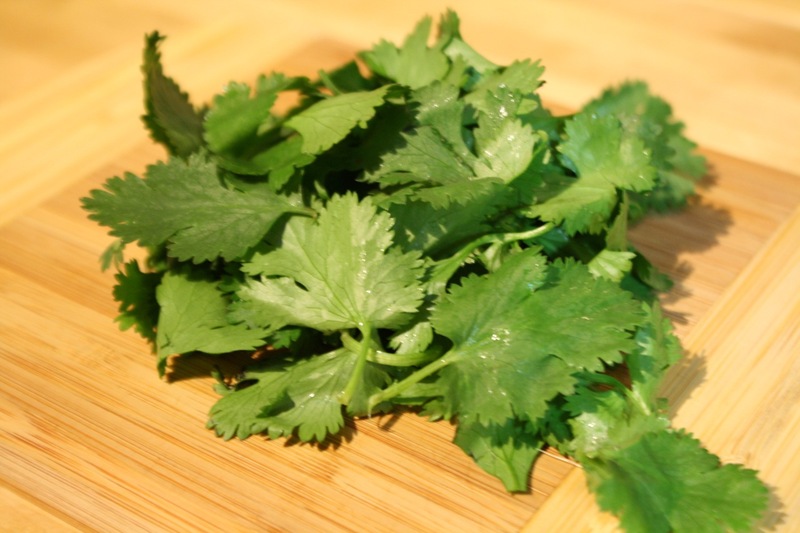 To finish things off, I added cilantro from my garden to the soup as a garnish and served. This recipe was adapted from “Charred Eggplant-Tomato Soup with Cilantro” from Cat Cora’s cookbook Cooking from the Hip.